By noon we had all the bikes back at Charlies Place with new oil, chains and filters, ready to be loaded. After four nights at the boutique hotel we became friends with the excellent staff and they came out to wish us buen viaje which is Spanish for have a nice trip. 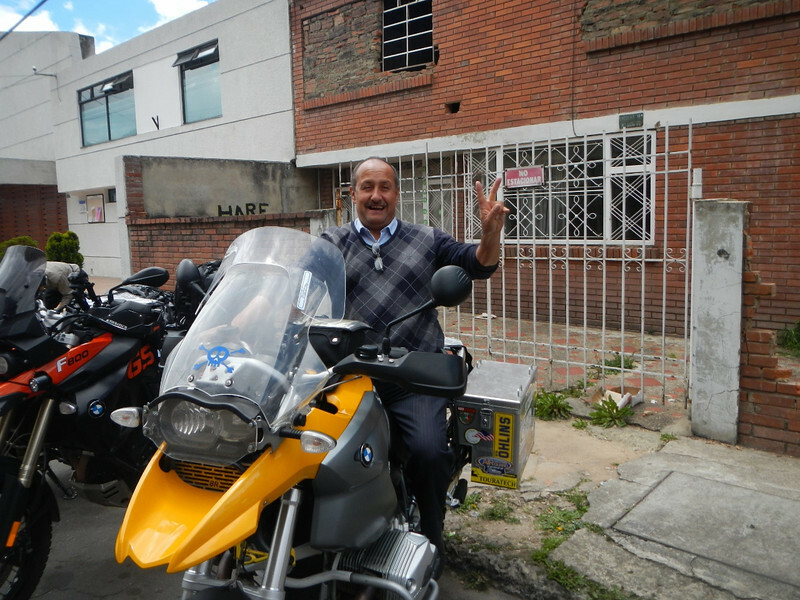 Here is Gustavo our driver for the duration of our stay. One of the front desk staff with Michael. With fond memories we said goodbye to Hotel Charlies Place. 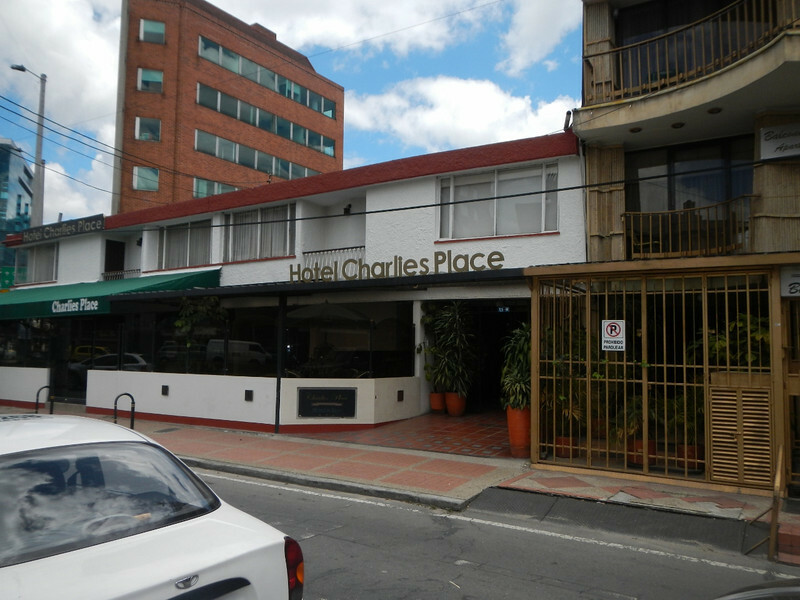 I would highly recommend a stay there if ever in Bogota. 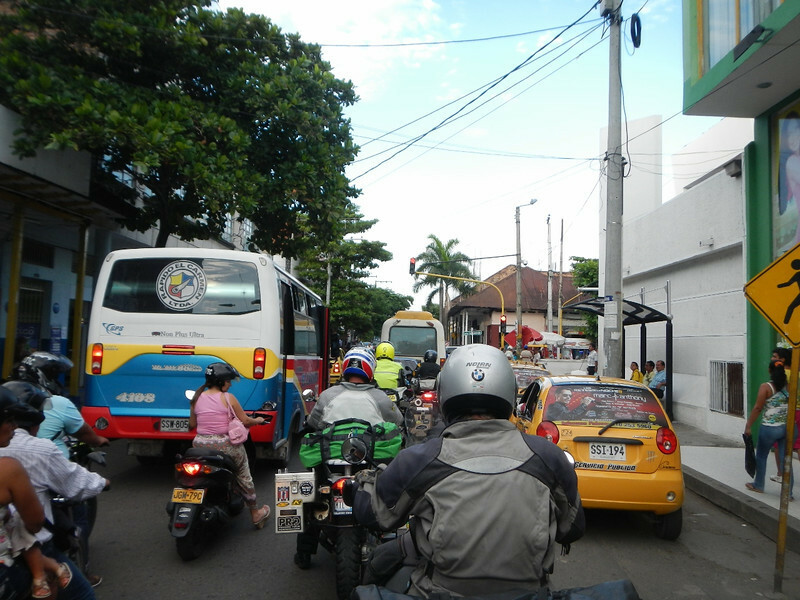 Once on the bikes our first challenge was navigating through the city towards our destination of Giradot. I managed a few pictures of us in traffic. It seems crazy, and it is, but we seem to be getting skilled at negotiating the madness. Here is an interesting picture. 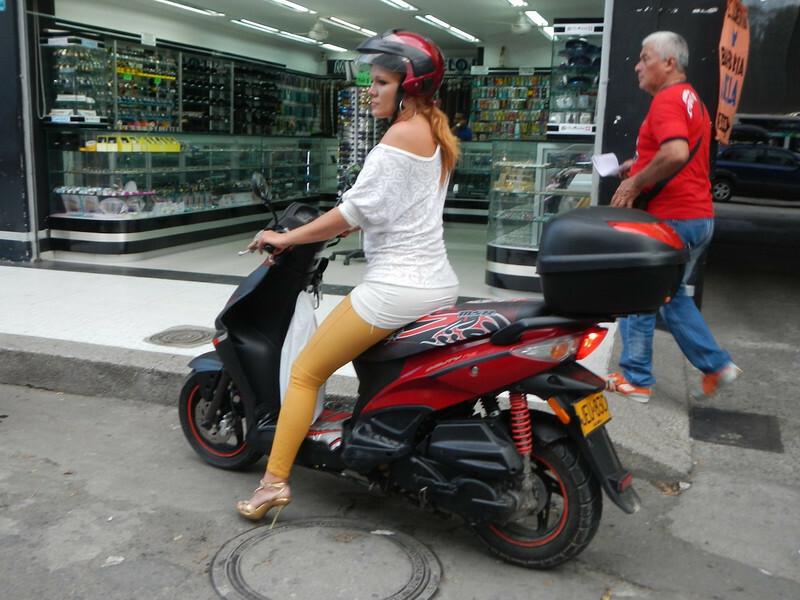 It was very common to see women all dressed up riding scooters. 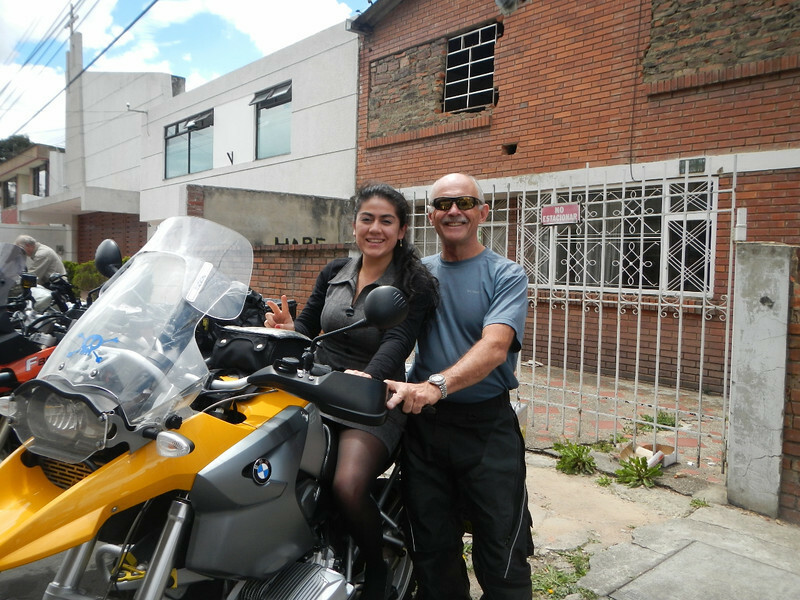 Once out of the city, it was a nice ride to Giradot on route 47, a road recommended by Gustavo from the BMW dealer. After our usual random tour of the town we ended up at a pretty nice resort with a welcome pool and cold cervezas. It seemed a shame to stay only one night at such a nice place but we have a continent to explore! Next: The “line” across the Andes to the coffee farm. 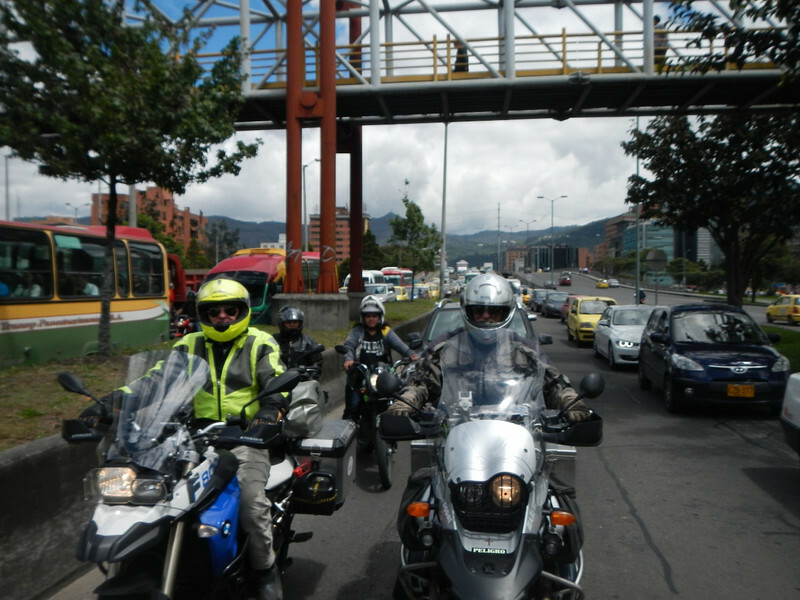 I have more Colombia picture HERE and you can follow our progress live by clicking HERE. I’m a few days behind in writing but hopefully I’ll have good wifi tonight and can get caught up. Today we plan on crossing the border into Ecuador. Still just so amazed to follow you. Take a moment to stop and just think about what you are doing. I just wish I was riding along side you all. How’s Deby doing with her GS650? I bet she is glad she moved up (or over) a bit from the GX650 eh? Listen Donn, I share a cubicle at work with a younger engineer who is from Quito and I’ve been asking him to see if he has any family or friends that I could give you as a contact. I know when I travel it is great to meet locals and see their homes and how they live. Makes the world smaller. 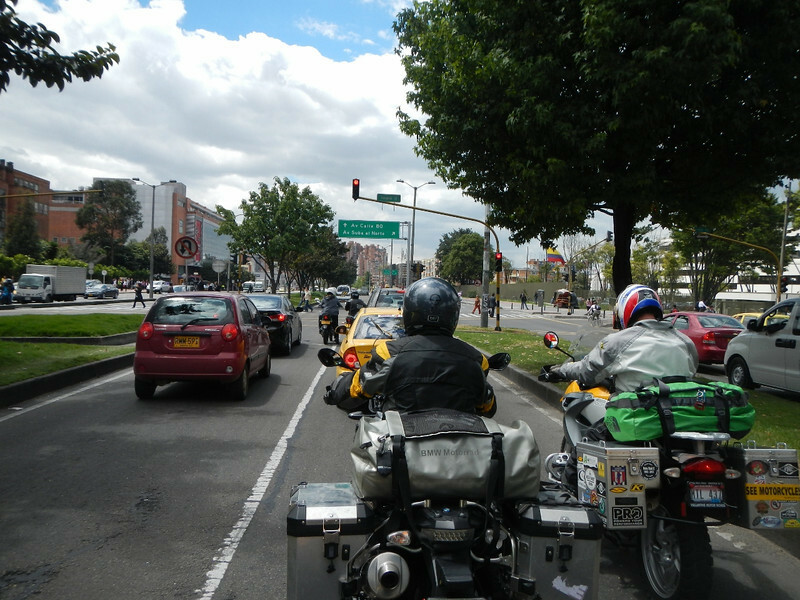 If having a contact in Quito is something you are interested in (no pressure you might be blasting through) or if you need anything them PM or email me… I don’t read this blog much (it’s too painful… oh the ENVY is crippling!). Ride Safe, eyes wide open, and sing in your helmet at least once a day! Hey Matt, good to hear from you. I just sent you an e-mail. Thanks for the comments.